I have long noticed that the Dharma seems to be for white people. From posting lyrics to quotes from Ta-Nehisi Coastes to quotes from Thanassara. If we are to go to enlightenment with all, we need to invite all the voices to be heard. My lack of awareness is part of my spiritual bypassing. Brushing aside the racial discussion by saying "I'm color blind," is to invalidate people's experiences where people were not color blind. Whites are quick to disavow racism and blacks often comfort them in their anxiety. I think increasing the anxiety is needed. I have heard deeply disturbing stories. A cursory reading of AA literature will make one understand not everyone's circumstances are the same and the color of one's skin can change that equation. Started reading this book: Radical Dharma. I have always hoped for a plurality of American voices in the Dharma world. I have not read William's book Being Black. Radical Dharma is an anthology of essays with Lama Rod Owens and Jasmine Syedullah. In the blurbs on the first pages, Sharon Salzberg reports she doesn't agree with everything said in the book. I suppose I see it as a report of experience, so it's hard to say it's not true. I had a bit of a reaction to "White Dharma". It's hard to imagine following the breath as racist, but the white capitalist patriarchy we live in is a context to the breath so why not? Can I follow black Dharma? The answer to me is no, because that's not my experience. I can bypass less. I grow by learning about other's experience. 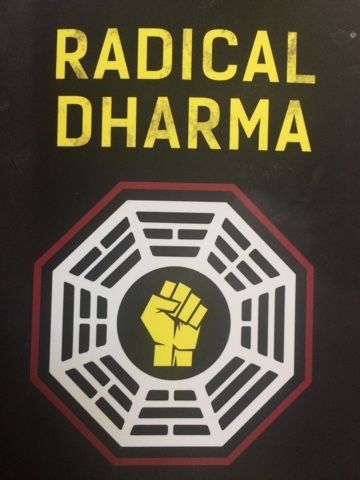 I'm not sure how "radical" the Dharma is in this book, to include black voices, but I am also reluctant to quibble with a person's word choices to express their experience. Maybe it gets radical further in. I think the Dharma is pretty radical on it's own. That Ms. Syedullah has gained racial consciousness in meditation seems like a good thing. These three authors fleshing out their thoughts seems a productive and useful contribution. I'm more inclined to think "long overdue". Only 25 pages in, I like the phrase "homeleaving". It flows better than "going forth". I realized today that again the challenges of parenthood are challenging me to change and adapt. "I have long noticed that the Dharma seems to be for white people." Say what? What on earth are you talking about? The vast majority of Buddhists live in Asia and are of various Asian ethnicities: Chinese, Japanese, Korean, Sri Lanka, Burma, Thailand, and not to mention Indian. And this is historically the case - Buddhism was an entirely a feature of Asian culture until about 200 years ago. In the UK we've recently seen that just 24% of Buddhists identify as ethnically "white". The other 76% are most ethnically Asian. "The Dharma seems to be for white people" is an outrageous statement! I think perhaps you mean that local Western Buddhist groups founded by middle-class white people, like our Order and Movement, mainly attract other middle-class white people. And as much as we like to think we are converting new Buddhists all the time, we still basically draw on the same cohort of middle-class baby-boomers. I don't really follow your reasoning. Perhaps you could spell out your unspoken assumptions about your attitude to ethnic minorities? On a recent retreat with Dharma Punx there were about 50 people. One person of Indian heritage and one person of Asian heritage. The rest seemed white. So that's 96% white on my last retreat. It's true there are a lot of ethnic Buddhists in NYC. And in the world. My experience in the TBC was similar. I remember two people of Asian heritage coming along for a little while, a black person once, and there was one black steady person in the sangha. Thank you for making my statement more specific and precise: "local Western Buddhist groups founded by middle-class white people, like our Order and Movement, mainly attract other middle-class white people."